The images show distant views of the space shuttle Atlantis (STS-122) on final approach to land at Kennedy Space Center at approximately 9:07 a.m. on 20 February 2008. Atlantis’ mission delivered the European laboratory “Columbus” to the International Space Station. 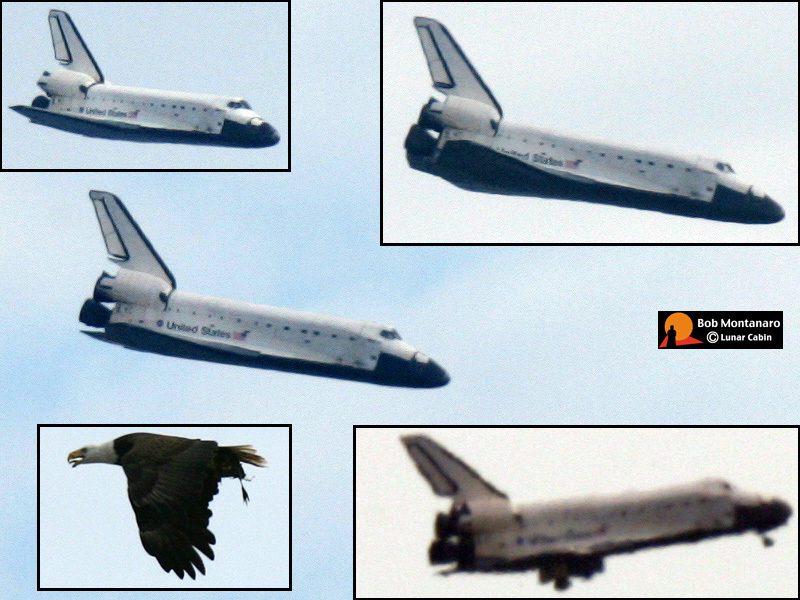 The images show at upper left the Atlantis breaking into view through the high cloud ceiling; at upper right, Atlantis rolls slightly to the left to line up with the runway; at bottom right, a very distant image blurred by intervening heat distortion shows Atlantis’ landing gear coming down; while, finally, at lower left, a very distant view of a Bald Eagle that flew by minutes before the landing.